Separation Songs is a haunting hour-long continuous work for two string quartets. In it, composer-performer-music technologist Matt Sargent systemically juxtaposes and weaves together an array of 18th-century composer William Billings’s hymn tunes, subtly altering certain aspects of them via real-time-generated variations as the piece unfolds. Sargent’s music has been described by critics as “a powerfully organic experience” (Sequenza21) and “so simple, so natural, and yet sets up a complex set of interactions” (SoundExpanse). Both quartet parts are performed on this recording by the Eclipse Quartet, a celebrated long-time stalwart of Los Angeles’s new music scene. untouched, like Adams’s The Wind in High Places (recorded on Cold Blue: The Wind in High Places, CB0041) is an exploration of the Aeolian sound world. Adams is a long-time associate of Cold Blue; his music has appeared on six of the label’s previous CDs. The Basketweave Elegies is an elegant, well-wrought vibraphone solo in nine sections. 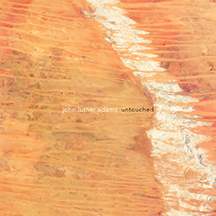 Commissioned and recorded by percussionist Joseph Van Hassel. Composer Peter Garland is a long-time associate of Cold Blue; his music has appeared on seven of the label’s previous CDs. Blue photographs collects a few dozen of the many aphoristic piano pieces Fox has written during the past 30 years. Performed by the composer.